Its time for me to do what just about everybody in Hawaii eventually does… head over to our “ninth island” Las Vegas. 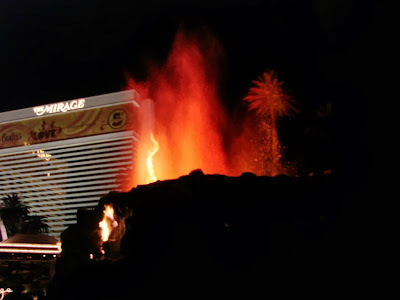 Here is a photo I took during my last visit of the volcano erupting in front of the Mirage Hotel. Vegas is a camera persons dream with all sorts of wondrous hotels and casino and of course the lure of winning it big. The Hawaii Blog will resume near Halloween. It would tell you more but as they say “What happens in Las Vegas, stays in Las Vegas”. Here is one of the places I’d like to visit one day the famed Machu Picchu. 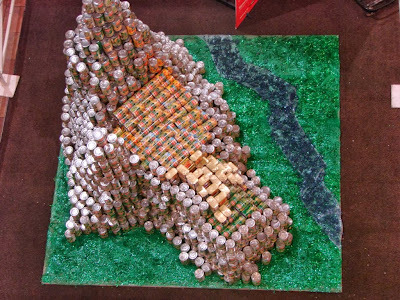 This design was created by Johnson Controls and entitled “We CAN provide a mountain of hope”. The green bean cans represent the grassy ares of Machu Picchu, the yellow cans represent the rays that shine and the beige cans represent the stones and rocks. Together they create a vision of life and nature we aspire to achieve, one can at a time. I hope you enjoyed out series. Go down to Pearlridge Centers uptown through October 27, 2013 to view these awesome designs. Bring cans to “vote” for your favorite and all cans in the displays and voting cans are donated to the Hawaii Foodbank. Last over over 23,961 pounds were donated and in the seven years of CANstruction 250,000 pounds of food have gone to the foodbank making enough for over 200,00 meals for the hungry. 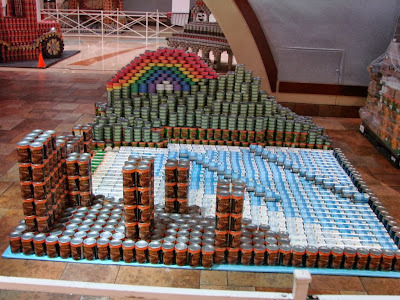 We continue our CANstruction 2013 series at Pearlridge Centers with this design by Bowers & Kubota Consulting. Entitiled “Mauka to Makai: A CANdid of Diamond Head” this display features this iconic image of Hawaii. From the islands unique natural features to the melting pop of cultures and people, Hawaii is ap lace like no others. However we do share with the rest of the world the unfortunate circumstances of hunger. By donating to the Hawaii Foodbank we can help prevent many families from going hungry every year. All cans in these designs go to the Hawaii Foodbank and also all cans donated by those voting on the best design. Tomorrow we wrap up the series.